Wedding gifts are a wonderful way for you to show your appreciation and caring for the newly wed couple. However it is hard to feel passionate about another blender or toaster. Buy the latest kitchen gadget or home décor item might be easy but it is not very unique and says that you hardly thought of the couple. However if you purchase a unique wedding gift that stands out from the others the couple will always remember the thoughtful gift. Below are some easy ideas that you can get for unique wedding gifts. All of these gifts can be shared by both the bride and groom and most of them create very nice memories of the wedding day. These unique wedding gifts are something that will hopefully sustain them through some of the rockier times later in their marriage. These have become very popular gift items and can be found almost anywhere online and also locally if you do a little searching. These items are a lot of fun as you can imagine the newly wed couple curled up together on the couch under a blanket with their own pictures on it. What a great way to truly celebrate the couple. You simply need anywhere between 1 to 45 good quality photos that can either be printed or in digital format. You can send these in to the company and in just a few days you will get back a beautiful quilt. One fun way to do this is take pictures of botht he bride and groom and their respective families. Then use the pictures to show the uniting of two families. Another fun idea that a photo quilt can be used for is as a guest book. Yes, that's right a guest book. Simple hang the quilt where guests will be entering before the ceremony and provide some nice sharpie permanent markers. Have everyone leave a unique and personalized message. Can't you just see it now a wonderful photo pillow on the newly wed couples bed? You send in your favorite picture of the bride and groom and it gets turned into a unique custom wedding gift pillow. How is that for personalized! you have probably all seen those cartoonists that will do caricatures of people at a local street fair or some other big gathering. 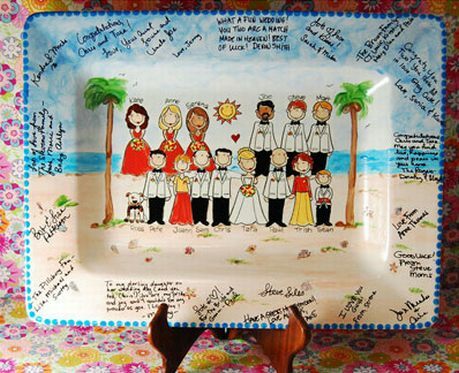 Well a family photo platter takes this idea and makes it into a very unique wedding gift. You can pick the skin color, hair color and basic body types to represent each person in the family. These make wonderfully unique gifts that everyone is sure to enjoy. Want to go all out and give a unique wedding gift. Try a custom wedding cake topper. 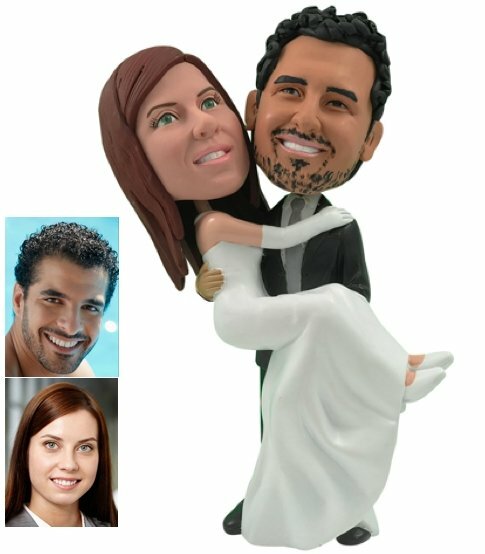 You send in pictures of the couple including images of their clothes and or activities that they like to do and a sculptor will make a custom wedding cake topper based on your input. Just make sure you work this out with the wedding planner and bride before spending the money. These are typically done in polymer clay and will last forever. These are just a few of the many of great ideas for unique wedding gifts. It is very popular and thoughtful to give something that has been personalized and this is something to consider as you search for your unique gift. Adding the personalization shows that you have taken the time to think about the newly weds and their likes and dislikes and not just gotten a stock out of the store mass produced gift. Whatever unique wedding gift you choose an important key it to plan ahead. You do not want to try and do any of the above ideas the day before the wedding. To make a gift personalized can take some time and you will want to leave two or more weeks to get the gift done. So plan ahead, be creative and have fun with your wedding gift and you are sure to end up with something they will remember and cherish forever. Much better then just another toaster that will get returned.